It has been one month and two days since we arrived in England, and it finally feels like we live here. We've passed the feeling of holiday-ing, and have arrived to a place of almost-normalcy. This weekend was our first weekend where we really felt like Cambridge was our town. On Saturday, I bought a bicycle. Everyone in Cambridge cycles around (and here, you say cycle, not bike), and it is a very bike-friendly city. Matthew bought a bike the second week we were here, and it really made his commute to work easier - instead of a 20+ minute wait for the permanently-late buses and a 25 minute bus ride, it is a 20 minute cycle. No brainer. 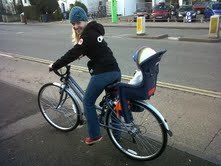 So we went to the local bike shop to buy me a bike with a bike seat for Elizabeth. Everyone working there was under 23 for sure, except for this one Dad-aged dude. And thank goodness for him, because he totally attached Elizabeth's seat for us and had to cut off a little doohicky so the seat could go low enough for my short-ness, and basically, he Dadded it up. He was the equivalent of the white-hair guys that work at Home Depot who are just so happy to help you find that little piece of tubing so you can try to fix your sink yourself, and who remind you that you need a gasket or whatever to make sure it doesn't leak. He was that guy! He told me about 3 times that I need to remember to turn on my lights when it's dark out, and that when Elizabeth gets bigger that I need to bring the bike back to have the height of her seat changed so she doesn't rest on the mud guards, and blah-blah-blah-safety-Dad-stuff. It was great. 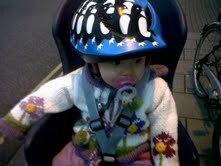 And we got E a tiny little helmet and now we zip around town! And get this: on Sunday, our friends Alex & Naomi Glancy came up for the day from London, and as we were walking to the town centre to meet them, we ran into someone I know. If that isn't a sign that you actually live somewhere, I don't know what is. Not gonna lie: I felt pretty cool. 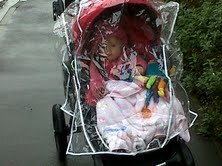 Here is a sign that Elizabeth lives in England: she has a raincover for her stroller that actually gets used. I love the bike helmet. You two look so cute on your bike. Very English chic. I have a rain cover, but we have never used it.